The Knights of the Round Table must renew their oath of Chivalry every year in order to assure the king of their honor. This includes mercy, fighting for good, and protecting ladies. Each knight in his own way is an example of these virtues. However, they all seem to succumb to temptation in one way or another. Thus the code proves to be a difficult thing to honor. In order for Mallory to emphasize the importance of the code of chivalry, it must be something that is difficult to live by. Launcelot is the finest of Arthur’s knights, yet he succumbs to his desires for Guenever. Sir Gawaine refuses to grant mercy to an enemy and must carry that guilt for the rest of his life. Only Galahad seems to maintain this code, mainly because he is so young and has not faced temptation quite like the others. 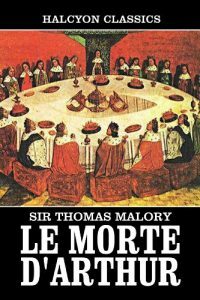 However much Mallory set out to exemplify honor, the text also offers numerous examples of less than honorable tendencies. Launcelot’s desire of Guenever increases throughout the story to the point that he directly competes with Arthur, the king, for her favor. He pays for this in the end. The rivalry between Tristram and King Mark is open and vicious. Mark goes out of his way to not only steal Isoud away from Tristram, but to taunt and torment Tristram over their jealous competition. We see old military forms of interpersonal battle overtake Christian ideals of honor throughout the text. Women are largely excluded from action in the story. They are objects of desire and embody the feminine courtly virtues. However, many of the women in the story are able to manipulate events by using the desires of men. Guenever is a central figure and Launcelot’s love for her sets much of his actions in motion. She does not really resort to manipulation and retains her virtue. It is Agravaine who breaks the code of discretion about the affair which brings the kingdom down. Isoud also remains a passive figure, but her place in the narrative makes her something of a lynchpin for the action between knights. Morgan le Fay is a direct rival for Merlin in making the magic occur in the story, but her role as an enchantress make her problematic in that she would not fit into the Christian morality so important to Mallory and his readers.